American-Born Chinese PI Lydia Chin is called in on what appears to be a simple case. Jeff Dunbar, art world insider, wants her to track down a rumor. Contemporary Chinese painting is sizzling hot on the art scene and no one is hotter than Chau Chun, known as the Ghost Hero. A talented and celebrated ink painter, Chau's highly-prized work mixes classical forms and modern political commentary. The rumor of new paintings by Chau is shaking up the art world. 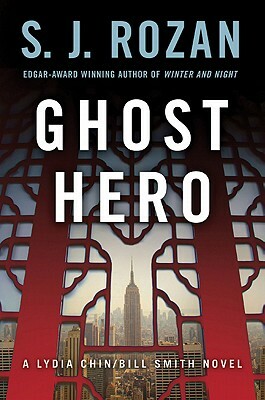 There’s only one problem – Ghost Hero Chau has been dead for twenty years, killed in the 1989 Tianamen Square uprising. S.J. ROZAN is author of many critically acclaimed novels which have won most of crime fiction's greatest honors, including the Edgar, Shamus, Anthony, Macavity, and Nero awards. Born and raised in the Bronx, Rozan now lives in lower Manhattan. "S.J. Rozan is a good old-fashioned mystery writer, and I mean that as a high compliment." --Maureen Corrigan, The Washington Post "...excellent ... Engaging characters, crisp dialogue, intelligent storytelling, and a minimum of violence add up to another winner for Rozan." --Publishers Weekly (Starred Review) "Rozan picks up the pace and adds a new plot twist to pull off another coup." --Marilyn Stasio, The New York Times "Rozan delivers another thoroughly entertaining, meticulously plotted and utterly riveting installment of her Lydia Chin/Bill Smith series.... rival PI Jack Lee is a delightful addition." --RT Book Reviews (Top Pick!) "...more cons and double-crosses than The Sting."